The person living next to me smokes inside of their apartment and it goes through the vents into my apartment. It is very unpleasant. Other than that I do not have any complaints. Hey Elise, I think I took care of that problem for you on Friday. You can always call in a work order so we can see if it is something fixable or a solution we can find. Like I said, I went ahead and took care of it Friday so come by or call the office to let me know if you are still having any issues. It's quick to downtown and UT. The interior is up to date, and quite big for my one bedroom apartment. I wish I had washer and dryer connections. Not allowing family members to swim without renter being present is a little strange. Had my dad and niece and nephew visit and I work during the day and they weren't allowed to swim. Just kind of...feels like a dictatorship. Also had a roach problem as soon as I moved in. Thank you for taking the time to give us a review. Unfortunately, as mentioned at move in and with all the signs posted at the pool, residents must accompany all guests at ALL times unless you are on the lease. It is a liability issue but the plus side of things are that we do not enforce the guest limit so if you are there, you could have your own pool party, grill out and make a day of it. The roach issue we had no idea since there were a few but we immediately had Orkin in that day, continued to follow up and had them service it again the next week as a precaution and luckily they were gone. We apologize and hopefully our quick response made things a bit better. We hope you are enjoying your stay here and always value our residents feedback. The apartments are nice but they aren't as quite as they say. Dogs barking day in and day old can get old. Outside of th noise, it's a pretty good place to live. Hi Jessica, thank you for the review. The apartments are brick and concrete so there is sound barrier that is greater than if you were in new construction. Imagine if it was not concrete and brick and the noise a barking dog would cause. Unfortunately, that is the downside of apartment living and not being in a single house. The great news is that all the residents in your area were called and the resident that had a dog barking just moved from out of State and his little guy was scared and still not used to his new surroundings but now the resident is aware and took measures to help with that and so far so good. Let us know if it is still a issue so we can address it and try and get you some relief. So far the other residents hearing the dog have mentioned that all is well again so I hope the same for you. The only problem we have is that our children's chalk art isn't allowed to stay on our patio floor, we're told to wash it off because it is unsightly. Hi Ashley, thank you so much for the review. We value you and your family as part of our family going on 2 years now. We think the chalk art is beautiful and colorful but the outside appearance has to stay "clean" so if you use it, we just ask that it be washed down so that the property stays neat and clean. What was mentioned as unsightly was all the soda cans and trash sitting out on your patio that just needed to be taken to the trash dumpsters that are provided and paid for by the property. The letter mentioned that it also causes unwanted "pest guests" and wildlife such as raccoons and possums that can be attracted to those sweet smells etc. We hope that clarifies things and again, we love having you here with us and always appreciate any feed back. I enjoy living at this apartment complex for the most part. It's a good location for me to commute to the local university. I love having the dog park and other amenities. Thanks for the review Kelley! We actually have had a few community events in the last few months but you weren't here! We know it is hard for everyone to attend due to work schedules etc. Maybe you will be able to attend our cookout at the pool in June. Dates will be decided soon and in the newsletter that goes out this month for June. Hope to see you there!!! I'm new to the area and it has been a great experience so far. The staff seem friendly and they provide tokens of appreciation every so often to the residents. Thank you Alicia for the review and welcome to Knoxville. You should check out Market Square sometime! Thank you so much for the great review! Staff is pretty awesome! HAHAHA, Let us know if you need anything. Friendly staff and maintenance! 10 minutes away from anything I would need. Clean, friendly, modern place to live. Quiet community. I have been here for 2 years and I just signed my lease for another year. We miss you but hope your are doing well!!! The one bedroom at the canyon has been perfect for me. It is spacious while also being cozy. I love that it feels like a house, not like an apartment. My neighbors are friendly, and my pup loves the dog park! Maintence is always friendly and on top of all issues, and office staff are always willing to lend a hand. Best place I’ve ever lived! Thank you so much for the awesome review!!! That's what a lot of current and former residents always said is that it feels more like a house or condo then an apartment. We have the best maintenance team hands down and the office staff ROCKS as well :) HA! Thanks again and we love having you as one of our sweet residents! Thank you for the review! That was not a good day but thankfully it was found. You were just the unlucky one. We are so glad that you are still with us and enjoying the bark park! It is super cool!!!! I have lived here for 2yrs and I have just resigned my lease for another year. I have a renovated one bedroom apartment and I have been pleased, overall. The bathroom is quite tiny (and has no cabinets or shelves) but all the other rooms are spacious. The kitchen is really nice and the balcony is HUGE. Although I wasn't initially thrilled with the location, I have grown to like this area of Knoxville. The Canyons is a great place for the price. Thank you so much for the review! Honestly, I have grown to this area as well and find myself on this side of town for EVERYTHING. Wonderful staff, beautiful landscape, pet friendly! Some apartments are on the small side. The price is great for college kids or starting out on your own. Everything has been great! My neighbors are awesome, the ladies in the office are super nice, and the apartment is so cute. It's also very peaceful. We love being able to have our dogs here and the facilities are well kept. We love that they take time to appreciate our veterans as well with military discounts! Our staff is pleasant to work with and the new improvements to the bark park have made having a pet here more exciting as well as expanding learning opportunities for the dogs when others aren't out in the park. I like that it is quiet. Community is clean and well maintained. Maintenance are always quick to fix any issues. Friendly neighbors and community staff. Our maintenance staff is the best. They are quick to get your issues resolved. Thank you for noticing that our lawn care company maintains the grounds and always keeps the flowers looking beautiful. This is your home and we take pride it keeping is clean. Thank you for the suggestion. As lower rent is always nice. We are improving on how the community looks. We are in the process of finishing up our (or may I say your) new Dog Wash. You do have access to the 24/7 fitness center, salt water pool (during spring and summer season), Dog Park, Volleyball Court and Tennis Court. We are always open to suggestions for a new amenity or how to make your home better. 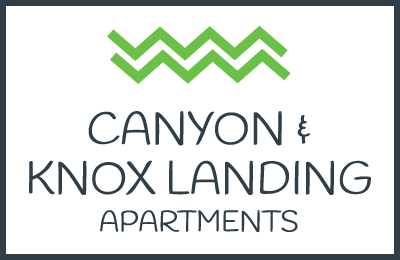 Nate and Bethany we are happy that you chose Canyon Knox as your apartment home! Quiet neighborhood with lots of amenities and clean apartments. Good place for pets, well accepted. During the summer months, large clean pool available as well! Madison, thank you for the review. We are very pet friendly. We are in the process of building a Dog Wash. This way it is easier to wash your pet instead of kneeling over the bathtub. We do have one of the largest/deepest pools in the apartment community area. I hope you will enjoy this season; it will be here before we know it! Thank you again for the review! They're incredibly nice and speedy with maintenance requests! When I moved in they gave me a welcome package and patiently answered my million questions! Great staff, location, and service. However, it’s incredibly noisy... On top of the expected upstairs neighbor noise, the constant yard work and construction is an understandable, but very frustrating issue. I am sorry that you are having a noise issue. If you have an issue with neighbors being noisy please let us know that way we can address the issue. Our landscapers are here every Tuesday unless weather is not good, then they come on another day. The landscapers make the community look clean and beautiful. They have to blow the leaves and any debris to clear off sidewalks for your safety. We have been replacing some siding and windows for the past 2 years due to some weathering. Some underground pipes had to be repaired that was out of our control. We are also installing a new dog wash across from your building for residents to give their pets a bath in the dog wash tubs instead of their personal bathtubs. Our service is top notch. Our maintenance team is on top of every maintenance issue quickly. I appreciate the review. I am glad that you have made Canyon Knox Landing your home! Please call me with any noise issues that you are having. My boyfriend and I love our apartment! The complex is always very clean and neat, management is lovely, and overall our experience has been good. Thank you Sarah for the review. We love having you both here! Hopefully we can keep you for awhile!!!! !